In this Saturday, Jan. 19, 2019 photo, the Brookfield Renewable hydroelectric facility stands at the Milford Dam on the Penobscot River in Milford, Maine. A plan to test the use of a new technology to help endangered Atlantic salmon has been abandoned, at least for now. Brookfield spokesman Andy Davis said the project's architects discovered a "significant risk" to species other than salmon, such as river herring. PORTLAND, Maine — A plan to test the use of a new technology to help endangered salmon in a Maine river that is critical to their existence has been abandoned, at least for now. Atlantic salmon return to very few rivers in the United States, and the most important of those is the Penobscot River in Maine, which is more than 100 miles long and empties into Penobscot Bay. Fish passages, such as ladder-like structures, are used around the world to help fish around difficult spots so they can eventually spawn. 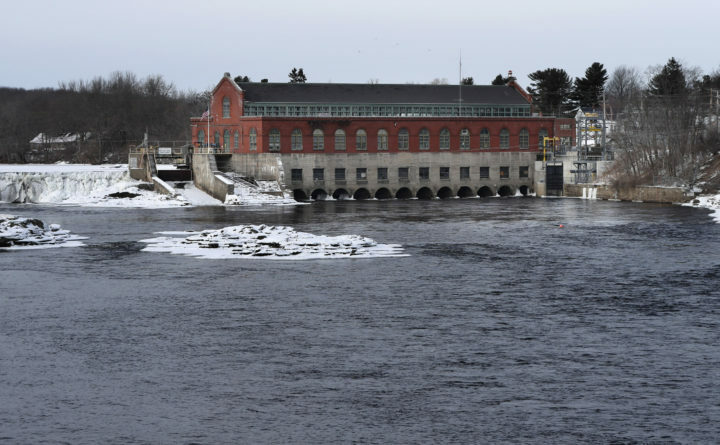 Brookfield Renewable of Toronto had planned to evaluate the performance of a new type of fish passage that might help Maine’s salmon navigate a hydroelectric facility the company operates on the Penobscot in Milford. The fish passage on the Penobscot was to be a system designed by Whooshh Innovations, a Seattle company. The system would have been designed to use pieces of flexible tube to propel the fish around potential obstacles. Davis said Brookfield is still hoping to use it, and has plans to test it out on alewives at a different location on the Saco River in southern Maine. Vince Bryan, chief executive officer of Whooshh, said his company is interested in making the Saco River project happen, and he still believes the system could have potential on the Penobscot in the future. He said the system has the ability to more efficiently move salmon and other fish through dangerous areas than older model solutions such as fish ladders and lifts. The Penobscot River is a closely watched body of water in conservation circles because it’s the most productive river for the salmon in the U.S. Maine’s also the only U.S. state left with native Atlantic salmon populations.